At a very young age every little girl begins to piece together the plans for her perfect wedding day… the dream dress, accented with the perfect flowers in the perfect shade of ?? ?, the perfect cake, the perfect dance, and of course the perfect groom. Unfortunately, life has a way of teaching us that there really is no such thing as perfection. By all means dream away! Fill your Pinterest boards with a collage of the most gorgeous images imaginable but just remember…most of these were made perfect using Photoshop! Besides crossing your “t”s and dotting your “I”s on all the wedding plans, may we suggest a few tactics that will ensure a day to remember forever…. Pinterest has unlocked the creative genius in each of us. Each swipe of your finger bring up eye candy! With all this perfection, it is no wonder the “bride to be” gets caught up in creating the perfect event with little tent signs labeling meticulously constructed finger foods and backdrops ornamented with vintage crystals. But, having a perfect wedding means realizing that you are working with imperfect people and unpredictable elements. Change your expectation to “beautiful” instead of “perfect” and you will be happy every time! I grew up watching my talented mother create elaborate wedding cakes that look like they came right off the pages of a Martha Stewart wedding edition. She worked tirelessly to make sure each element of the cake with created with care. I often heard her meeting with the prospective brides who came with champagne ideas on a beer budget! Many of the brides were so determined to micro manage the creation of their culinary masterpiece that they undermined her artistic freedom and judgement. I found that when brides gave her their ideas and trusted her expertise to fill in the blanks, the result WAS a masterpiece. Most likely you hired experts in confection, flowers, display, music, etc. Give them the liberty to use their artistic creativity and you will get a pleasant surprise. You have all met them…the bridezilla who is demanding, ornery and self centered. It is a proven fact that those who are pleasant, workable, and flexible get much more for their money. There are going to be mistakes and mishaps, just plan on it and make the decision now to look on the bright side. The unexpected make the best stories anyway! Let’s face it, all the planning in the world matters nothing if you don’t have someone to share it with. At the end of the day, sharing this special day with family and friends is what makes it all worth it. Most likely many of your family and friends have spent countless hours to get to your venue, taken time off work, and made adjustments in their schedule to be there for you. Your appreciation and graciousness go along way. Yes, it is all about you today, but make it all about them and you will stand out in the crowd. “If something can go wrong, it will”. With so many moving parts, there is bound be something that goes awry on your special day. There are a lot of things you just cannot avoid no matter how well you have planned, but being prepared for “little emergencies” will ease a lot of the anxiety that comes along with your special day. We at “In A Pikle” have the perfect solution! Loose button…we got you covered! BBQ sauce on your dress….we got you covered! The “In A Pikle” bag with Starter Pak comes with over 20 items sure to solve your wedding day mishaps! 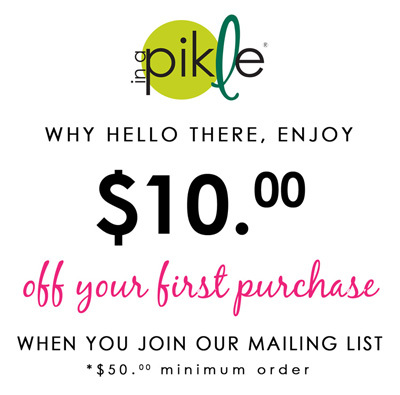 Treat your bridesmaid to a “Pikle” too and they will thank you over and over again!